Success is not just about Money! it’s about TIMe, too. Lifestyle has always been, and will always be, priority #1 for me. The cool thing is, when I switched to a 3-day workweek, my business took off. Because I was honoring my time more than ever before. I was putting my value first and foremost, and people responded to that — big time! After stepping into my 3-day workweek and studying with some of the best and brightest minds in the coaching and personal development world, I uncovered a framework that I now teach to my clients so they, too, can create full-time income $$$ working part-time hours. Better yet, this framework, which I now call the Success Made Simple™ Framework, is totally customizable to fit your business and lifestyle and will unlock a personalized plan for working less, making more and living better that’s perfect for you, your life and your business. As your coach, I'm most interested in creating a simple, joy-filled plan to reach your most important milestones. Whether you’re ready to have your first 6-figure year, implement a recurring revenue stream, scale to $10K months or whatever else your heart and soul long for, my intention is to use my Success Made Simple™ Framework to find a path that is ideal for you — one that affords you an abundance of time, energy and money the whole way there. If that sounds like exactly what you're desiring, you can submit your application here. Achieving success felt hard, elusive and confusing. Feeling like a failure who was ready to give up. Making just $22.50 the July before my business took off. Feeling behind, left out and like I was “missing something” that other successful entrepreneurs had figured out. Clear, simple plan of inspired action. Success on my terms feels natural, easy and simple. Featured in Business Insider, She Means Business Podcast, Entrepreneur on Fire & dozens of other podcasts. Waitlist of perfect-for-me, high-end clients. NOTHING feels better or delivers bigger wins than creating success on YOUR TERMS with Success Made Simple™. Success Made Simple Coaching™ is a multi-thousand dollar investment. Payment plans available. Serious applicants only please. Together, let’s get you Success Made Simple™. Having the time + money to do things you love like travel, go out to dinner, attend weekly yoga classes, buy yourself nice clothes or get a massage! ...Success Made Simple Coaching™ can unlock all that for you! “While working one-on-one with Cailen, I landed a perfect-for-me client paying me $1000 a week for my services!!!" 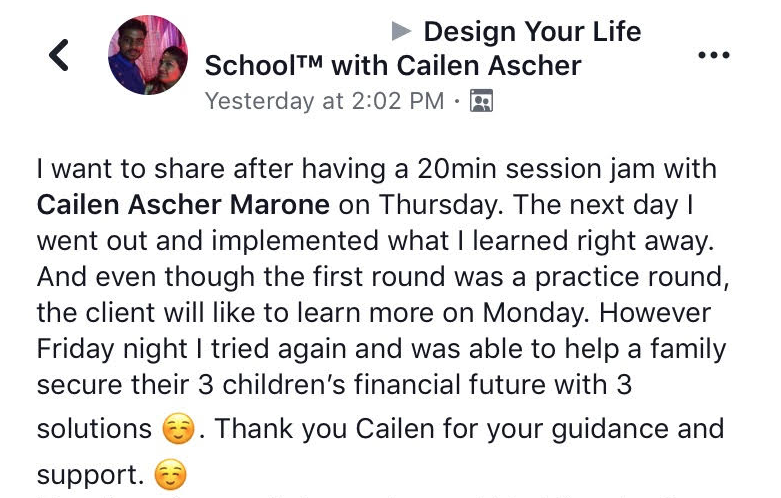 Cailen’s high-touch Success Made Simple Coaching™ is an investment of several thousand dollars. Payment plans available. Serve them better than anyone else! so you can generate an abundant full-time income while working Hours that Feel-good! "Cailen is energetic and well-spoken, a great listener and communicator. After working with Cailen, I now have a clear understanding of who I want to work with and how to attract them to my business. I’ve defined my “why” and how to communicate it clearly. I now know how to communicate with “my woman." To kick-off your coaching you’ll have a 2-Hour Intensive with Cailen to discuss your BIG vision, identify top priorities and map out a course of inspired action. 4 months of coaching to move you successfully through the Success Made Simple™ Framework (framework details outlined above). Coaching includes a 2-Hour VIP Intensive followed by 6 bi-weekly sessions via Zoom. Sessions are approximately 50 minutes in length. Pre-coaching Welcome Packet to get clear on where you are now and exactly where you want to go (BIG vision!) so that we can co-create the most effective coaching experience possible. During your 4 months with Cailen, you will work through her proprietary Success Made Simple™ Framework. This framework builds you a completely customized action plan for full-time income with part-time hours. You'll receive call notes and recordings from all sessions — including outlines, action plans and resources — all typed-up and clearly organized to help you plan + execute your BIGGEST goals in the simplest way possible. Additionally, you’ll receive specialized resources and action sheets specifically selected or designed for you to ensure that you get the most out of your 1x1 Success Made Simple™ coaching. These resources will be added to your private Google Drive folder so that you can access them anytime, anywhere. For the duration of coaching, you will be just one of a small handful of people who have direct access to me via my personal email. This ensures that you'll have my continued support, guidance and feedback during our 4 months of work together. All of my 1x1 clients get complimentary access to any and all of my programs that they would enjoy diving into including Attract High-End Clients, The 3-Day Workweek Program, Money Clarity, Success Made Simple Academy™, and more! Success Made Simple™Coaching is an investment of several thousand dollars. Payment plans available. Coaching is based on Cailen's Success Made Simple™ Framework and tailored to meet your specific needs. And, above all else, how to set you up to generate an abundant full-time income while working part-time hours! Are you ready to generate an abundant full-time income working part-time hours?! Limited spots available. Serious applicants only, please. "The strategy we discussed worked like a charm! I did exactly what we talked about in our 1st session, and I now have another new client - woo-hoo! Plus another two women have emailed me and one of those has set up a consultation call for next week. Thanks so much, Cailen! " Success Made Simple Coaching™ is an investment of several thousand dollars. Payment plans available.